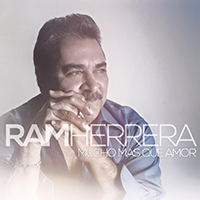 I’ve got to admit: When I read the announcement that Grammy winning producer Gilbert Velasquez and Tejano great Chente Barrera partnered up to form VMB Music Group, I expected them to produce some amazing material, but Ram Herrera’s Mucho Mas Que Amor is one of those productions that has staying power. What do I mean by staying power? Well, in the case of Ram Herrera, it brings back memories of his ’84 Dancebuster album and some of his 90s hey day productions–tunes that are still popular and make much of the crooner’s repertoire. The Tejano artist who got his start as the frontman for David Lee Garza y Los Musicales and made famous Cuatro Caminos still has the voice decades after hitting it big. After being on big labels during the 90s hey day, he went through a few indie labels and finally arrived at VBM Music Group. I must say that this new production is among his best–from Track 1 on through to 11. Kicking off with Eres Mi Todo, a standard ranchera, Herrera sets a foundation for the album–all Tejano. The acordeon-heavy Donde Estara will get one on the dance floor. The first single (and videoDC ) is Dime Si Estoy Loco, with a familiar Ram Herrera cumbia sound and with a pretty awesome guitar break. With these tunes, the groove for the album is set, and the addition of a ballad (Yo Te Amo), another cumbia (Alejate), a country tune (I Wonder If She’s Still in San Antone), and some pretty powerful rancheras (Los Años being my personal favorite), and Herrera and his musicians knock it out of the park. With the help of some great acordeon and some powerful guitar breaks, Herrera’s latest should be a contender for a Grammy. That said, kudos must go to Grammy winning producer Gilbert Velasquez and VMB. Yo Te Amo, with its trio style, backed by horns, is a beautiful ballad, while one particular ranchera made famous by Selena Amame Quiereme, was made available to Herrera who makes it his own. Rounding out the tunes are Te Necesito, Angel De Mi Querer, and Porque Dios Mio. Already in demand, VMB released the album for digital download (I went to CDBaby.com), but it will be available for hard-copy orders on Tuesday, July 14. Get yours today! You will not be disappointed. This entry was posted in Cultura, Reviews and tagged gilbert velasquez, mucho mas que amor, ram herrera, vmb music group. Bookmark the permalink.